In a win over Russell (Ky.) this week, Wheelersburg’s Tanner Holden enjoyed his second 50-point outing of the season. New Boston’s Kyle Sexton continues to be a force for the Tigers, scoring 31 points in two wins this week. PORTSMOUTH — As we continue to learn more about each of our area teams, this past week’s action featured big-time non-conference bouts, important league tilts and plenty of marquee performances. A. If I’m a coach, I’m hoping and praying that my team isn’t matched up with South Webster’s girls in an early sectional tournament contest. The Jeeps, who sit at 8-10, started the season at 2-9 before ripping off six wins in seven contests — the latest of which came in a 45-34 decision over Northwest. With Maddie Cooks, Baylee Cox, Bri Claxon and more, South Webster could pose a threat to anybody on the right night. B. Wheelersburg’s boys are 16-0 after wins over Russell (Ky.), Northwest, and South Point this past week. The Pirates beat the Red Devils by an 83-64 final on the heels of a 50-point, 13-rebound performance before dismantling the Mohawks, 86-23 … yes, that’s an actual final. Obviously, the AP No. 2 ranked Pirates are very good. But there’s much work to be done. Wheelersburg coach Steven Ater says his players are still learning and still need to do a better job on the defensive end. If you’re wondering why ‘Burg is so good, read the last sentence again. C. If you haven’t yet heard of Trey Robertson, you might as well get used to hearing his name. Waverly’s freshman guard stands at just 4-foot-11 but his level of talent is as large as anyone’s. He’s a threat to score from anywhere on the court — and I do mean anywhere — and handles the basketball extremely well. Standing beside Cody Remington and Cobe Marquez in Waverly’s backcourt, it’s pick your poison when matching up against the Tigers. I’m under the assumption that Tanner Holden’s 50-point, 13-rebound performance is already asuumed by you to have made an impact. So moving on … New Boston’s Kyle Sexton played like, well, Kyle Sexton all week long. In two wins, Sexton scored 31 points and brought down 20-plus rebounds. But that’s a regular week for the sophomore stud. In Friday’s win over Valley, Waverly’s Cobe Marquez was the definition of “floor general.” The senior scored an early 10 points before letting the his teammates get involved in the fun. The Tigers beat the Indians 75-50 and Marquez ended the night with 14 points and six assists. He then scored seven in Saturday’s 79-44 win over Miami Trace. Without Marquez, the Tigers’ dynamic offense wouldn’t be near the same. Waverly’s Trey Robertson … told you that you’d see that name … with a filthy mix of creating separation from his defender and finding nothing but the bottom of the net. The fun starts early in the week on the girls side as Oak Hill travels to Notre Dame and Northwest makes a trip to Clay Monday. Thursday, Minford north to Waverly for a conference matchup and Green hosts Western the same night. But Saturday … well, that’s the big one. Starting around 12:45 p.m., three local girls teams will be competing Tackett’s Body Shop Shootout at Ironton High School. Wheelersburg faces West Carter (Ky.) first, followed by a matchup between Minford and Russell (Ky) around 2:30. Last but certainly not least is a date to watch Notre Dame take on Waynesville, a game that’s slotted to start at 4:15. On the boys side, Green heads to Ironton St. Joe Monday evening while Wheelersburg travels to Waverly Friday night for what’s sure to be an electric atmosphere. 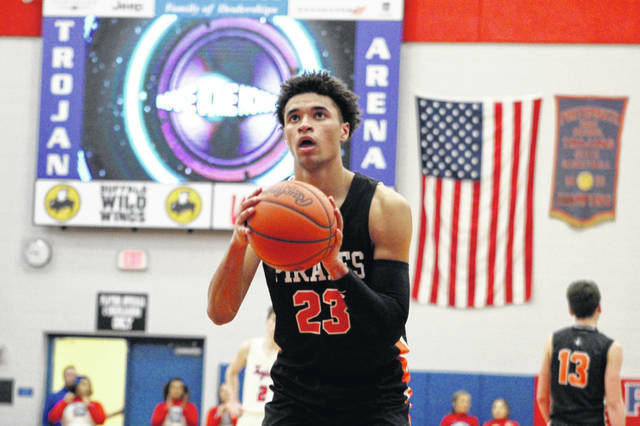 https://www.portsmouth-dailytimes.com/wp-content/uploads/sites/28/2019/01/web1_Holden-4.jpgIn a win over Russell (Ky.) this week, Wheelersburg’s Tanner Holden enjoyed his second 50-point outing of the season. 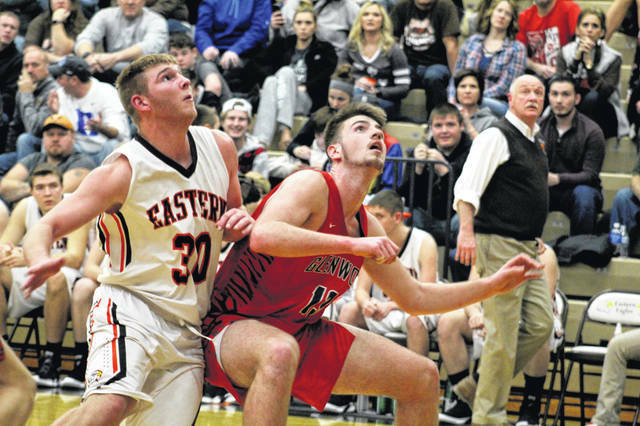 https://www.portsmouth-dailytimes.com/wp-content/uploads/sites/28/2019/01/web1_Sexton-1.jpgNew Boston’s Kyle Sexton continues to be a force for the Tigers, scoring 31 points in two wins this week.